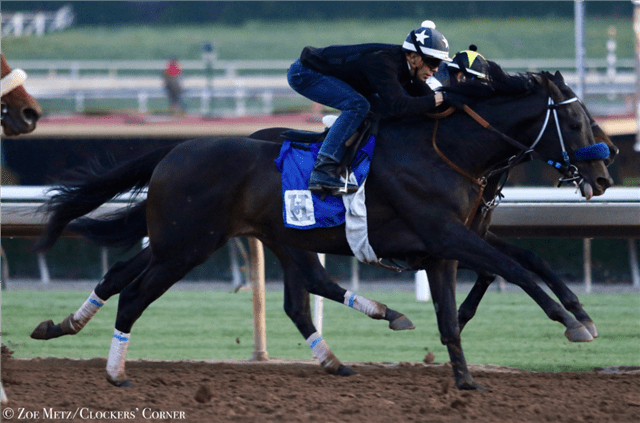 Instilled Regard had his final major work for next Saturday's Grade I, $1 million Santa Anita Derby, going five furlongs at 6:45 Saturday morning for the West Coast's major steppingstone to the May 5 Kentucky Derby. Instilled Regard was timed in 1:01.60 under exercise rider Edgar Rodriguez. Instilled Regard, winner of the Lecomte Stakes and fourth as the favorite in the Risen Star at the Fair Grounds, went in company with Shackleford Banks, clocked in 1:02.80. Some three hours after that news, word from Dubai was that McKinzie would miss the race due to a problem in one of his hind legs, trainer Bob Baffert told The Blood-Horse. There was an issue and then he was fine the next day—he was sound . . . He's not going to make the Santa Anita Derby. He's definitely out,” Baffert said. That would leave the Santa Anita Derby door open for Baffert's budding three-year-old superstar Justify to run in the race. “It depends on how he breezes Monday,” Baffert told Daily Racing Form. Two longshots could enter the Santa Anita Derby, one being Keith Desormeaux trainee Ayacara, a well-beaten fifth in the San Felipe, and Victor Garcia trainee Pepe Toni, third in the Robert B. Lewis Stakes and a distant third behind Justify in an overnight race on March 11. Ayacara worked five furlongs in 1:01 Saturday morning, while Pepe Toni is scheduled to breeze Sunday, after which Garcia is likely to render a decision on whether to enter or not. Evin Roman would have the mount. Entries for the Santa Anita Derby and six other stakes on the blockbuster 12-race card, including the Grade I Santa Anita Oaks, will be taken this Wednesday, April 4. The Santa Anita Derby awards 100 Kentucky Derby qualifying points to the winner, 40 to the runner-up, 20 for third and 10 for fourth. The winner's share is $600,000. Second is worth $200,000, third $120,000 and fourth $50,000. This entry was posted in NL List, Triple Crown and tagged ayacara, Bob Baffert, bolt d'oro, instilled regard, jerry hollendorfer, Justify, mckinzie, mick ruis, road to the kentucky derby, santa anita, santa anita derby by Ed Golden/Santa Anita. Bookmark the permalink.